There are many ways you can access Twitter from your new iPad, including the official Twitter for iPad app, some great alternatives like Tweetbot and Twitterrific, and even the Twitter.com website directly from Safari. Twitter integration is even built into iOS 5 so you can tweet pictures, for example, from right inside many other apps. Whether you're a power user or just an occasional browser, there are a lot of great ways to get tweeting from your iPad. To get all the latest news, reviews, and help from iMore right on Facebook, make sure to follow us as well! The official Twitter for iPad app can be installed right from the Twitter Settings of your iPhone. The current version has one of the most audacious, forward-thinking interfaces of any iPad app, using sliding panels to show multiple layers of content. Unfortunately, Twitter hasn't put a lot of time and effort into adding features to it, and there's a lot it simply doesn't do. Since Twitter is busy redesigning all their apps to match their new website, it's likely this version of Twitter isn't long for the world either. Still, it's free, visually impressive, and a great way to look a lot of Twitter content quickly. 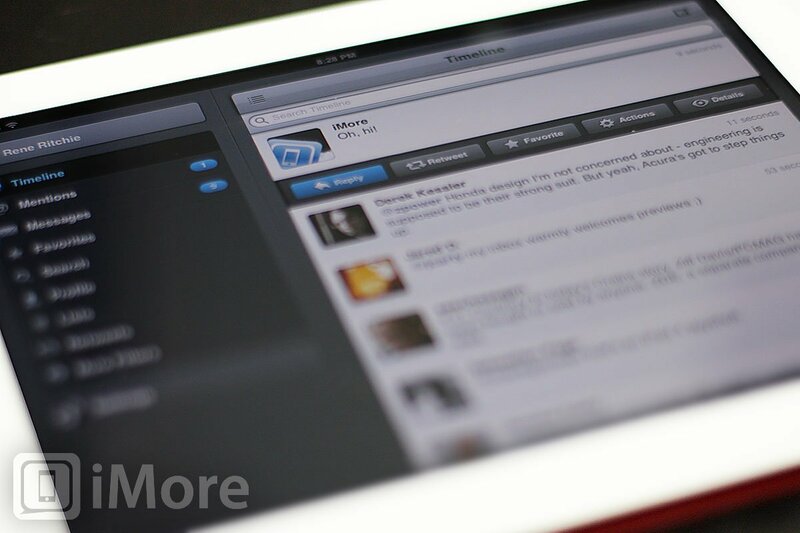 Tweetbot is an iMore staff favorite. It's a powerhouse of functionality and includes the best push notifications of any Twitter app, and great features like muting people, hashtags, and other tweets (so you don't have to unfollow your boss or avoid Twitter so it doesn't spoil a movie or big game for you.) If you're looking for a beautiful client with tons of functionality, look no further than Tweetbot. Twitterrific is the original iOS Twitter app, and it was the first Twitter app out for the iPad as well. It features a unified timeline so you can see all your followers' tweets, your mentions, and any direct messages all in the same place and in order. That makes it a great reading experience and a nice way to get started for brand new Twitter users. It's also free for single account use. Maybe you just don't need to use Twitter all that often and only feel the need to poke around when you're bored or reading news. If that's the case you may not want notifications or a native app cluttering up your homescreen real estate. Safari works just fine for Twitter. They've actually got a mobile website that allows you to navigate around quickly and easily. You can tweet, reply, check notifications, view profiles, and do pretty much the same things you'd be able to do from the computer based version of Twitter straight from your iPad. I have noticed the mobile web version of Twitter is a bit laggy at times. I recommend downloading the native Twitter app for free over using Safari if you plan on browsing Twitter regularly.